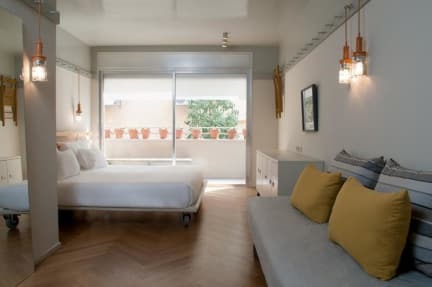 Florentin House is a 5 floor modern hostel at the center of the funky Florentin neighborhood in Tel Aviv, only 1km from the beach and city center. Facilities at Florentin House its communal lobby-lounge, a 24-hour front desk with all the info you need in Tel Aviv. The hostel arranges group events, live music as well as daily tours of the city. Florentin area is full with of unique shops, restaurants and hipster bars. Rothschild avenue are within a 10-minute walk, as well as the popular Neve Tzedek picturist neighborhood. There are a number of beautiful Bauhaus buildings in the area and museums. 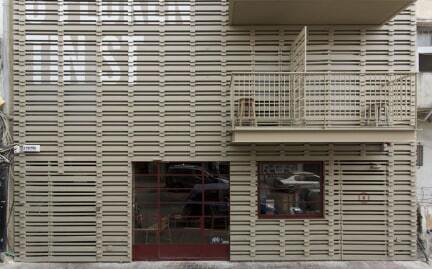 Florentin is a great choice for travelers interested in Tel Aviv’s youth culture, arts, nightlife and music. This is our guests favorite part of Tel Aviv offering unforgettable local experience. Shared and private rooms are available, as well as dorm rooms. It offers air-conditioned rooms, super comfortable queen/king size beds and free Wi-Fi in all areas. Everything is included: luxurious shower, towels and linens, daily cleaning service. Payment upon arrival by cash (ILS, USD, EUR), credit cards (Visa, Mastercard, Isracard, American Express). Florentin House reserves the right to pre-authorize credit cards prior to arrival. Taxes included. Israeli citizenship should add 17% VAT to the total price. Sorry, you can't bring pets into our house. Guide dogs are more than welcome. A wonderful place to stay if you're looking for a great night sleep, comfy and clean living, very helpful staff, and cool new people / fellow travelers. This place was fabulous, very modern and in a great location. Cleanliness was spot on and the beds were like heaven. We didn’t want to leave. Staff were very helpful. If you decide to eat at restaurant next door book in advance. This hostel is amazing. The staff are friendly, knowledgeable, interesting, and helpful. The area is very, very hipster with a wonderfully vibrant culture and a pulse that reflects its youthfulness. The hostel also reflects this but remains very professional and efficient at the same time. Security is very good, and the whole place is clean and modern. This hostel and area is not exclusive to young people... older people who still retain a thirst for life will love it too. Highly recommend! Stayed in the 6 bed dorm & was really happy to find such a large locker to organize my stuff in, modern bathroom facilities & a good bunch of other travelers to hang out with. Help yourself iced water in reception was a nice touch. The Florentin area is hip with street cafes, small supermarkets, hairdressers & other amenities. 20 min walk from old Jaffa, seafront & Camel market. Will def book to stay again. This hostel was much like a hotel in terms of the standard of the rooms (although they were dorms). Everything was new and fantastic quality. It was in a great location surrounded by nice bars and restaurants and not too far of a walk to other attractions. The staff were friendly and helpful. The only thing I could fault was that there was nowhere communal to hang out and meet people and no breakfast included. As a solo traveller this made my time in Tel Aviv more isolated. Nice place. Clean, good staff, good part of town and breakfast is included at the cafe across the road. Two drawbacks during our stay: (1) this place did not have its own parking, which was one of the reasons we booked it. There was instead street parking and a private parking lot nearby; (2) our room faced the road and it was very noisy for most of the night and morning through traffic and road works which started early. The hostel is very well located in the hip Florentin neighbourhood. Beds are comfortable and bathrooms are clean. There is, however, a few disadvantages: 24/7 hours reception means that there are people arriving and leaving litterally all night in our dorm (at 2 am, 4 am, 6 am...). There is a "kitchen", but all dishes are made of PLASTIC for singe use only :( Also there is NO stove. Atmosphere-wise, the place is rather a hotel than a hostel; thus not worth the high price per night.